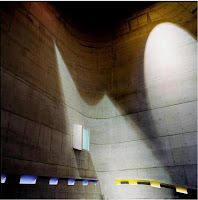 What does Le Corbusier’s Firminy Church in France have to do Louis Sullivan’s K.A.M. Pilgrim Baptist Church in Chicago? Besides that you see they both sport a great arch. Well, Corbu died without finishing Firminy. But the local government recognized its cultural importance and committed funds so it will stand. Now they want to rebuild on the site, but maybe not exactly to Sullivan’s design! That’s bone-headed. 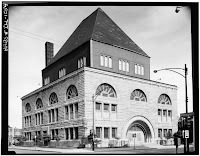 It is Louis Sullivan’s church that needs to stand on that corner on the south side of Chicago. Rebuild it the way it was and consecrate it to culture. 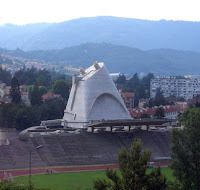 The French paid to complete the unfinished Corbu church, then “consecrated it” to culture. “In 2003, although without enthusiasm, the local government restarted construction, but not as a chapel. It is against the law in France for the state to fund a religious building, so it is now a cultural centre with a cross on the roof. This is a building that defines us as a world community. It is as important as the Sydney Opera House, or Bilbao’s Guggenheim, the pyramids, St Peter’s in Rome, Angkor Wat and Beijing’s Forbidden City. Or Sullivan’s K.A.M. Pilgrim Baptist Church. 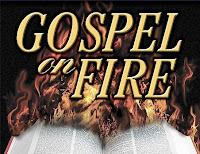 So lease the land in perpetuity from the congregation, give them the church building they want, and which will better serve their needs, and turn K.A.M. Pilgrim Baptist into a cultural center to serve the memories of Sullivan, Thomas Dorsey, Mahalia Jackson, gospel music and the community around it. Le Corbusier was a master at using big, tough, harsh materials softly. His genius is in the way he could provide in a single building an explanation of the human condition that contains so many histories. At Firminy, there is the original cave, the sophisticated geometries of renaissance and Gothic churches, the sculptural forms of Asia and Africa, and the simplicity of abstract modernism. Strangely, one of the world’s most beautiful chapels may never be consecrated. K.A.M. 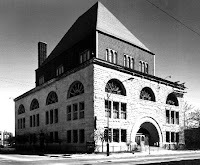 Pilgrim Baptist by Louis Sullivan to be reborn – as what? 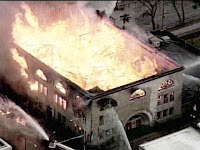 Most of the church nee synagogue burned to the ground, due to negligence during maintenance, a little over a year ago. Today Deacon Robert Vaughn named Johnson & Lee, Ltd. as the architect for the rebuilding. Well, I’m glad it’ll be “really nice.” Sorry to be cynical, and maybe the story will turn out well, we must make sure it does. Visit Johnson & Lee, Ltd.’s website to see what they’ve designed to date. They’ll work with the highly-respected Quinn Evans Architects, of Ann Arbor, Michigan and Washington D.C. That firm has worked on the restoration of two buildings with important historical connections to African Americans, one in Detroit and the other in Topeka, Kan.
Today architect Christopher Lee promised to respect the work of Louis Sullivan and Dankmar Adler. What does that mean specifically? We did not respect Adler and Sullivan and their gifts – or ourselves – when we didn’t protect Pilgrim Baptist and it burnt to the ground. Let’s respect ourselves now by rebuilding at 33rd and Indiana, Louis Sullivan and Dankmar Adler’s moving design, completed in 1891. We’ve got to raise public and private money for that. Walking through K.A.M. Pilgrim Baptist and hearing gospel music sung there tells us who we are and who we were and who we can be. Involve John Vinci in the restoration. He knows the place inside and out, has detailed photos and drawings and has already restored it once. And consult with Chicago’s Cultural Historian Tim Samuelson, (audio link). He’ll also make sure the Sullivan spirit survives. Then please, rebuild K.A.M. to Adler and Sullivan’s original design. If they could do it so magnificently in 1890-91, why can’t we today? You are currently browsing the archives for the K.A.M. category.